CREDAI Hyderabad formally announced the launch of their New Officeat Lumbini Mall, Road No 2, Banjara Hills . The new premises was inaugurated by Sri.Etela Rajender, Minister for Finance and Planning, Govt. of Telangana along with SriJupally Krishna Rao,Minister for panchayat Raj & Rural Development, Govt. of Telangana Sri.Charlakola Laxma Reddy, Minister for Health& Medical, Govt. of Telangana, Sri Chintala Ramachandra Reddy, MLAalong with the CREDAI senior leadership team comprising of Sri S. Ram Reddy, President CREDAI Hyderabad, Sri. P Ramakrishna Reddy, General Secretary CREDAI Hyderabad, K. Rajeshwar, Treasurer, CREDAI Hyderabad along with Vice Presidents Sri Aditya Gowra, Sri G. Anand Reddy, Dr. M.S. Anand Rao, Sri. D. Muralikrishna Reddy and the Joint Secretaries Sri C G Murali Mohan, Sri. V. Rajeshwar Reddyin the presence of large number of developers, stakeholders and industry members. The New Office which is a constructed on an area of 5000 sftwill be creating with a state of the art Training and conference hall and a provision to develop 500sft Library which will house a series of books on different aspects of construction and real estate development. These facilities will be managed by a dedicated staff responsible for liasoning with the various stake holders to plan and develop various skill development and training programs for the Members & Associates of CREDAI. Sri.Etela Rajender, Minister for Finance and Planning, Govt. 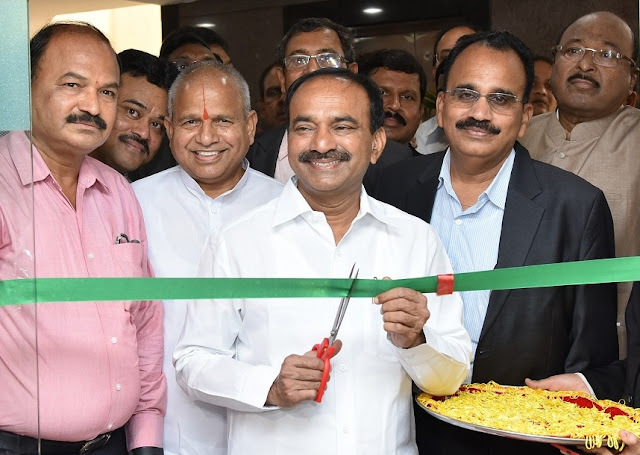 of Telangana, Mr. S. Ram Reddy, President-CREDAI Hyderabad, Mr. P Ramakrishna Rao, General Secretary-CREDAI, Hyderabad inaugurating the CREDAI Hyderabad New Office. Adding to this Sri. D. Muralikrishna Reddy, Vice President, CREDAI Hyderabadsaid , “We are happy to announce the New CREDAI Office space in Hyderabad will be helping our Members to have a more constructive and participative outlook. We at CREDAI are always working towards helping our stakeholders deliver the best to consumers . CREDAI Hyderabad aims to promote a culture of training and development and is taking all steps to create the right infrastructure to promote the same ”.